For other uses, see Tea party (disambiguation). A tea party is a formal, ritualized gathering for the small meal called afternoon tea. Formal tea parties are often characterized by the use of prestige utensils, such as porcelain, bone china or silver. The table is made to look its prettiest, with cloth napkins and matching cups and plates. In addition to tea, larger parties may provide punch, or in cold weather, hot chocolate. The tea is accompanied by a variety of foods that are easy to manage while in a sitting room: thin sandwiches, such as cucumber or tomato, cake slices, buns or rolls, cookies, biscuits and scones are all common. The afternoon tea party was a feature of great houses in the Victorian and Edwardian ages in the United Kingdom and the Gilded Age in the United States, as well as in all continental Europe (France, Germany, and above all in the Russian Empire). The formal tea party still survives as a special event, as in the debutante teas of some affluent American communities. In the older version, servants stayed outside the room until needed. Writing in 1922, Emily Post asserted that servants were never to enter the room unless rung for, to bring in fresh water and dishes or to remove used dishes. This was partly due to the rigidity of social convention at the time, but it also reflected the intimate nature of the afternoon tea. Proving the truth of 18th-century author Henry Fielding's quip that "love and scandal are the best sweeteners of tea", the custom of banning servants from the drawing room during tea shows the hostess's desire to encourage free conversation among her guests. Most of the formalities of that age have disappeared, particularly since World War II, when economic changes made household servants a rarity, but afternoon tea can still provide a good opportunity for intimate conversation and a refreshing light meal. A less formal large afternoon party for tea was known during the 18th and 19th centuries as a "kettle drum". A widespread but possibly false folk etymology suggests that the name "kettle drum" may have originated in the informal tea gatherings hosted by British camp officers' wives during East India Company rule or the British occupation of India, during which kettle drums are claimed to have served as tea tables in the camps. Alternatively, "kettle drum" may have been an amalgam of "drum" — 18th-century slang for a vivacious party — and "kettle" for the tea served. At kettle drums, guests traditionally came for short periods and left at will, mingled and conversed with little formality, and partook of tea, chocolate, lemonade, cakes, and sandwiches. Guests were expected to dress for ordinary daytime visiting, but not more formally. Tea parties are also created by young children where the guests consist of stuffed animals, dolls, friends (both real and imaginary) and family members. In the chapter "A Mad Tea-Party" in Alice's Adventures in Wonderland, Alice becomes a guest at a tea party along with the March Hare, the Hatter, and a sleeping Dormouse who remains asleep for most of the chapter. The other characters give Alice many riddles and stories, including the famous 'Why is a raven like a writing desk?'. The Hatter reveals that they have tea all day because time has punished him by eternally standing still at 6 pm (tea time). Alice becomes insulted and tired of being bombarded with riddles and she leaves, claiming that it was the stupidest tea party that she had ever been to. Yum cha is the Chinese equivalent of a tea party, though it is usually held in a restaurant. ^ The Complete Book Of Wedding Crafts - Page 64 Rockport Publishers - 2005 "A tea party is a perfect example of the latter. Tea, sandwiches, cookies, and — best of all — a chance to hang out with your pals." ^ The Bridesmaid Guide: Modern Advice on Etiquette, Parties, and ... - Page 68 Kate Chynoweth - 2011 "Easy Concept: When the guest list includes ladies ages eight to eighty, a traditional tea party is an excellent way to entertain. Swap complicated shower themes and rowdy party games for a simple afternoon of charming conversation, delicious ..."
^ "12. The Well-Appointed House. Post, Emily. 1922. Etiquette". www.bartleby.com. Retrieved 2015-11-10. ^ Martin, Judith (1990). Miss Manners' Guide for the Turn-of-the-Millennium. Simon & Schuster. pp. 452–453. ISBN 9780671722289. Retrieved 5 November 2014. ^ Farrow, Edward Samuel (1895). Farrow's military encyclopedia: a dictionary of military knowledge. Military-Naval Publishing Company. p. 152. Retrieved 5 November 2014. ^ Chambers, William; Chambers, Robert, eds. (20 November 1875). "The Kettle-Drum". Chambers's Journal of Popular Literature, Science and Arts. 4th series (621): 737. Retrieved 17 November 2014. ^ Strategies for including children with special needs in early ... - Page 144 M. Diane Klein, Ruth E. Cook, Anne Marie Richardson-Gibbs - 2001 "Helpful. Hint. The traditional tea party and feeding a doll are two of the most engaging ways of introducing children with special needs to pretend play." ^ Gardner, Martin. "The Annotated Alice". Clarkson N Potter Inc, 1960, Chapter VII. ^ Jolliffe, Lee (2007). Tea and Tourism: Tourists, Traditions and Transformations. page 56. "Yum cha, for example, is a traditional tea party and a family gathering that takes place in a commercial catering outlet." 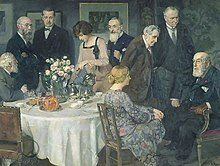 Wikimedia Commons has media related to Tea parties.